When she moved to New York and started working as a factory welder in 1944, Antonia Pantoja saw the blatant racism and discrimination against Puerto Ricans. They needed leadership and vision to help them restore their dignity. They needed to learn about their rights and political power. Pantoja had come to the United States to pursue her education, and she saw education as an answer to many problems. She earned her masters of social work degree in 1954 and a doctorate nearly twenty years later. She began teaching with a profound interest in addressing the needs of disadvantaged children. In the 1950s she led a group of young Puerto Rican activists to seek innovative solutions to the high dropout rates and the debilitating unemployment. They had to become active in their own destinies. She helped build numerous institutions that offered support. In 1961 Pantoja organized the ASPIRA (“strive”) Club in New York. ASPIRA brought Latino students together to educate them and develop their leadership skills. They worked with educators and social work professionals who shared Pantoja’s concern for the high dropout rates among Puerto Rican students. ASPIRA grew into a national organization dedicated to empowering communities and Puerto Rican youths in particular. In 1952, she helped found the Puerto Rican Association for Community Affairs (PRACA), the first Puerto Rican civil rights advocacy organization. It focused on leadership development and women’s issues. In 1957, she formed the Puerto Rican Forum, a think tank to come up with special projects to address the community’s needs. It turned into the National Puerto Rican Forum, a service organization that has trained nearly 1 million Hispanics and helped them find employment. She was a pioneer for the advancement of bilingual education, and advocated litigation against the New York City Board of Education in 1972. It resulted in a landmark case mandating bilingual education in the school system. As a professor at the Columbia University School of Social Work, she learned of resources that could help communities. In 1970, she wrote a grant proposal and secured funding to establish the Puerto Rican Re-search and Resource Center, an organization devoted to data collection and policy development. Dr. Pantoja moved to California for health reasons, and she became an associate professor of social work at San Diego State University. She founded the Graduate School for Community Development, an institution that serves communities and neighborhoods throughout the nation by helping citizens develop their own problem-solving skills. In 1973, she founded Universidad Boricua, a Puerto Rican research center and bilingual university, and in 1985 launched Producir, a project that enables rural communities to create cottage industries, generate employment, and provide services. 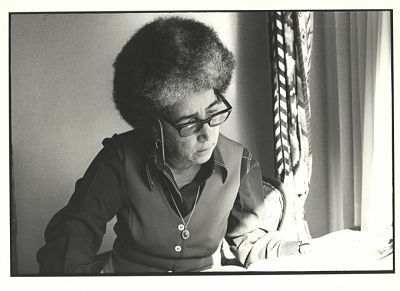 When she returned to New York in 1998, she wrote her autobiography, Memoir of a Visionary: Antonia Pantoja, published by Arte Publico in 2002. It is a model of commitment and vision. In 2001, she helped found the Latino Educational Media Center, which disseminates media information on the Latino experience in the United States. Pantoja was the first Puerto Rican Latina to receive the Presidential Medal of Freedom Award, which she received in 1996 from President Bill Clinton. It is the highest honor bestowed upon a civilian by the United States government. Only three other Puerto Ricans have received the honor.